A thoughtful place to land found it recently in past diary entries when I was in the Philippines last January. Its the birthplace of my parents and a place I hold very close. 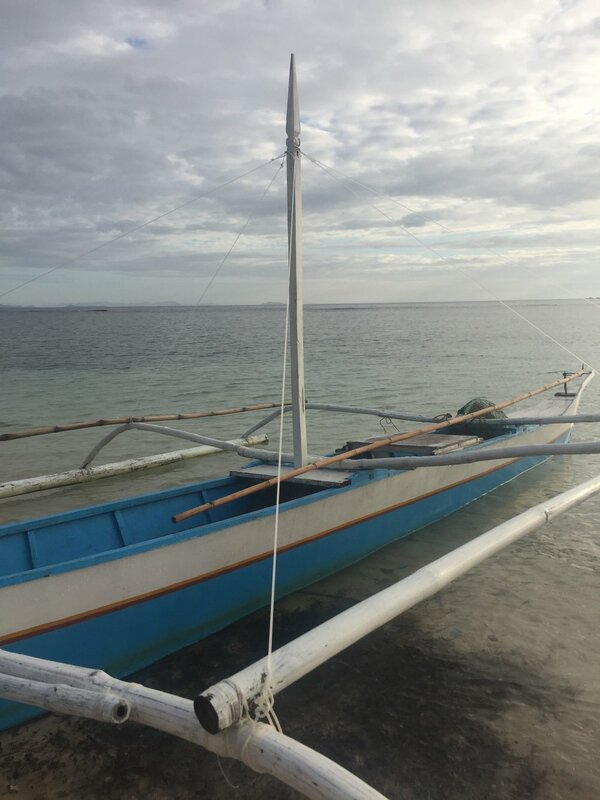 I wrote in a diary on the water, early in the morning on a bangka, a sweet little boat made by hand with bamboo and wood; painted mostly in a bright blue; easily made by locals, and what I believe is becoming illegal to build bc of a new license rule. I was with Germee, a new dear friend and jewelry designer who introduced me to a very sweet and generous group. We were working on a collaboration line for her jewelry company in different parts of the Philippines. The trip ended on a small island in Palawan. In these entries, I hear myself think and am reminded of a slow clarity. This slow clarity is gold to me, and what I share here. Maybe a simple, slow story from the water can help find that clear space again, opening the path in yourself to create. This path, our lifeline to creativity, gets so cluttered with stuff. Since this is verbatim from my diary, much of it is stream of conscious. I don't believe you have to have been to the Philippines or on a boat to get into it. Its a simple story. The setting begins on the water, and ends on a small piece of land w/ no electricity and fresh water brought from neighboring islands. Its a small island between the South China Sea and the Sulu Sea. A home to friends who call it, Keelooma. Germee and I were a bit woozy from the ride on the Montenegro (an old, large 70s speed boat inherited from west Africa aka “the main ferry” from El Nido to Coron). When we got to Coron, we are met by Jubal, his partner Mark, and his brother Jayson. They purchase some staples, and we board the bangka to their island, Keelooma. First 1/2 hour we stopped at towering limestone rocks for lunch.........then 4 hrs or so to their island. The water is many shades of blue and full of small waves. You see little silvery sparkles in the distance, float for a few seconds above the water. “Schools of happy fish”, Jubal says. There is something that happens to me when so close to moving water for hours, especially on a bangka, a crouched mantis on the water. The water is close underneath you; inches from your feet; Flowing and rolling. (Though we tread slower than a speed boat, its too fast to dangle your feet in the water as you go. I realize how much my body had been thirsting for this). The sea here is soft compared to the Pacific or the Atlantic........these boats easily navigate. 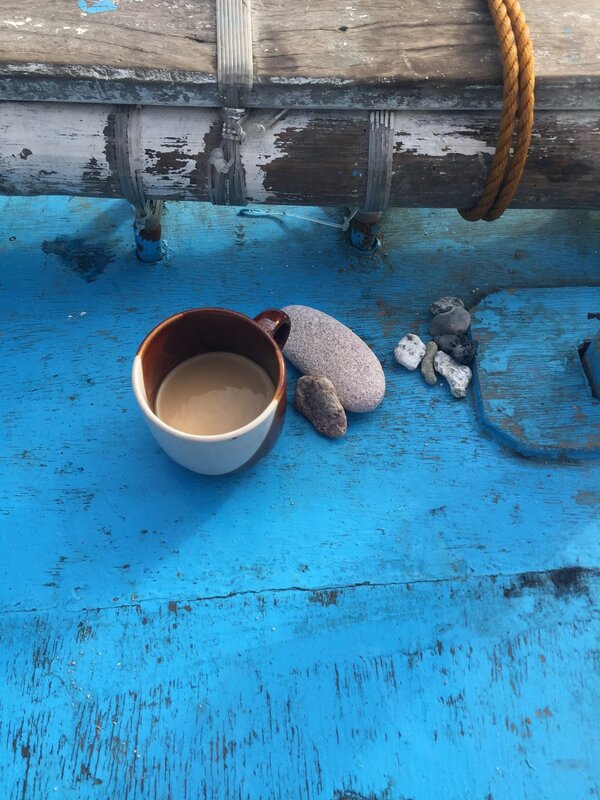 The small crew, 3 family members - el capitain being Alvin - fry fish in a pot over coal when the sea is calmer. They know this water well. The oil in the wok is a balancing game with the waves. A circle of oil up & down like a scale, inside the chinese vessel. Their sense of balance is very clear and more precise than they let on. The beauty of the Filipino. Depth and understanding a given. An assumed silence. Not wanting to break with the wind/nature’s dialogue. A culture that seeks and finds harmony through a lot of silence. In some moments to hear us, you have to get close or pull it from us. At least that’s the feeling for me living in the US, where an old phrase is a lie: Silence is not golden in America. We leave the lunch spot around 230pm and it takes till after 6, sundown to Keelooma. The waves get bigger as night approaches and the light blue transforms to dense black. As we arrive, its hard for the crew to land into the 1st cove. They need to find a way to get into shore. They stop trying and think for a moment, while we roll on the big waves. I get a little nervous. I'm a strong swimmer, but I know the shore is much farther than it appears. I hear Jubal with giddy enthusiasm “never seen it this big before”. Seeing this in his eyes, I look away and smile trusting in the crew’s silence. Our bangka surfs the big waves in & success. We end up in the 4th cove and dock, its wider than the 1st. We get in safe and unharmed. its so quiet and beautiful. I remember I forgot my headlamp as Jubal and Jayson turn theirs on lighting the way. They are home. I realize what an adventure this is. I think how less nervous I am than in the city. I feel so at peace here amongst the sway of the grass, trees, and ocean. You feel them in the dark. Funny where we all belong. 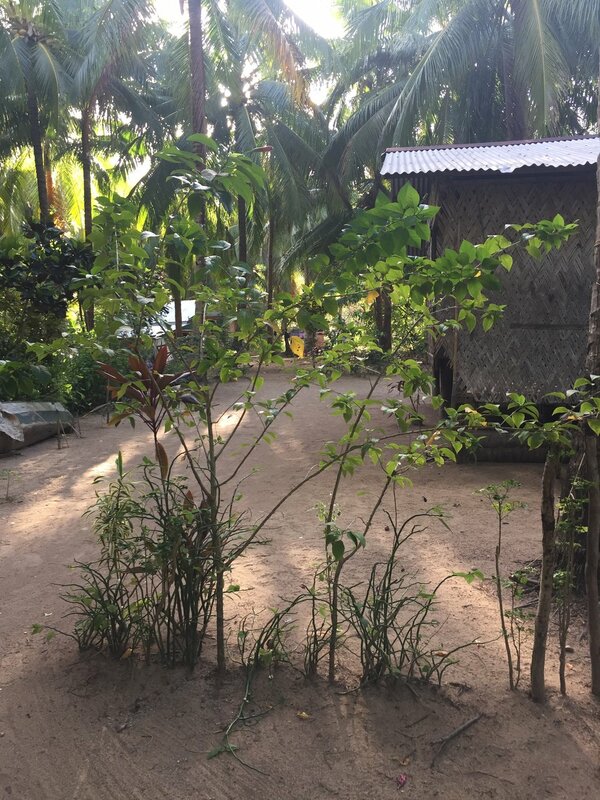 Good Morning to the peeking of the eyes opening up to the slight wind, slight stickiness, full palm trees, rooster crows, smell of fires burning in the distance, chinelas (flip-flops) clacking on the sandy path; light waves hitting the shore. The trip is coming to a close and my feelings are with Ripley (my 1.5 yr old) and her little arms and how I can't wait to squeeze her. be with her. A total wonder of nature she is. Just as this place. Which is inside her. What a gift it is to be Filipino. To have this beauty in our blood. These sounds in our soul. The calm silent strength that resides in this place. Its maybe 6am-ish. To start, we climb the mountain behind the camp. All of this reminds me of Roraima. How experiencing deeply with nature - spurs intense creative juices in human beings. This, I must take note. We pass the neighbors’ nipa huts. They stand calm, so cute, so precise - always just what you need. One hut has a little entrance with tall wild flowers trimmed yet natural. Only if you look closely can you see the care. The manicured wild flowers create a little fence, sweet and unassuming. Inviting, yet creates a small boundary. the sand is swept zen. The man who lives there is an artist and made the huts where we sleep. His half woven roof edges lay near the entrance to his hut. We see him, he smiles. His eyes warm. Again, the knowing silence. (A warm wind has come in rn; the wind's been slowly dying down since we arrived). We walk further and up up up the mtn, we pass cashew trees, tapioca trees, mango trees and red wild flowers (as I sit here, all moves so quietly and slowly; only with a wide open eye can you see things move. All is silent and moves without notice to other senses). Its steeper climbing down - we are sweaty and hot. Feels so good to sweat amongst greenery in a narrow path. Could be an installation. We get to the other side of the mtn and we can't stop collecting the normalcies of the island. Little dried up coral shells - some miniature (Isamu) Noguchi’s - bleached white from the sun and smoothed by the wind and water. I wonder how long it takes for a piece of rough coral to turn smooth - walls of it sit on the shore - how one coral becomes more smooth than the next......by being stationary for a certain amount of time? Moved only by wind and salt water? Can we be the same? Smoother to touch by remaining stationary with Nature? A definite metaphor to life. We talk so much about life here. Our similarities, our differences. The contrasts being the most fruitful conversations. We talk endlessly on the boat. About love, about our quirky personalities and of those we have met in life. Give and receive, we sponge each other and glide on the water between rock and wave. Its a healing experience being with friends and the water. We design our project while on the water as we go, and design when we get back to camp in the sparse light from the little solar powered LED bulb, taking inspiration from our findings from the day. Germee walks around (especially in the mornings) without her glasses so she sees only waves of color - and gets more in tune with the rest of her body. I love her way. The water this morning is like glass. We slice through effortlessly. My body is sticky and warm from the intense sun yesterday, mixed with little mosquito bites from last night. The pinkish light from the sweet, early morning sun loosening itself from horizon’s grip, highlights my notebook rn. Golden like the pearls in TayTay. I turn to Germee about that pearl in one of our pieces........Then back to group silence. I pretend the little bug bites are little farewell messages....little reminders on my skin. They'll be with me the next few days. I start to think about them on the cold plane back to NYC tomorrow. I immediately revert back to where i am. Buko (coconuts) sit behind me. My mouth salivates. Just as growing up with family, you do everything with each other here. You wait for each other, and wait till you are bitingly hungry, or thirsty to replenish together. No one alone. I smile to myself and am reminded of it and its understood. Minimal and work with what you have. We arrive to another beach to have breakfast on the boat together. Fish caught this morning w/ rice, calamansi, soy sauce. 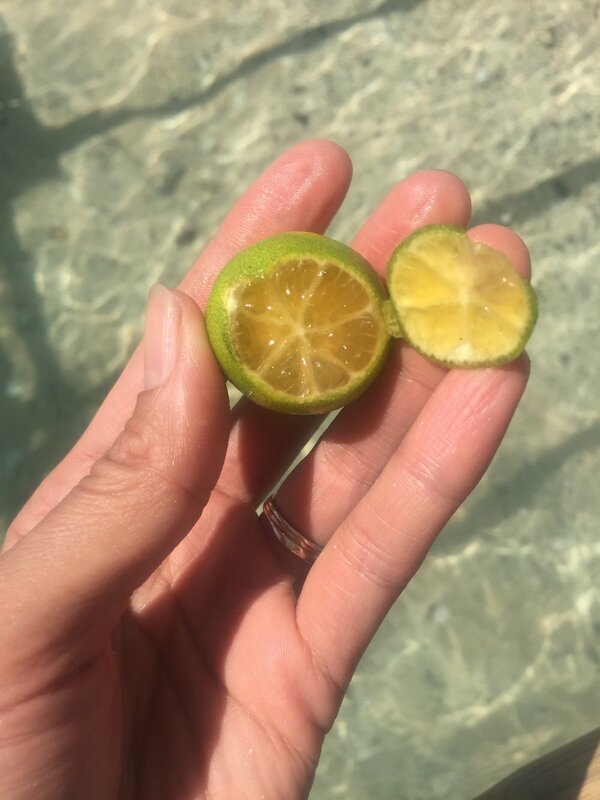 I squeeze the calamansi into the communal soy sauce bowl, watching the bright lime green seeds float. We eat with our hands, something natural after a few days doing it. From my hand to mouth, I feel the extension of tradition and lick my fingers. salty.